Ford is using its proprietary 3-D CAVE virtual reality system to bring new prototypes to life, allowing engineers to tweak interior structures and features wearing 3-D glasses, thus speeding the evolution of the Focus and other vehicles the brand builds. The development process for a new vehicle design was once a decades long process, but the new 3-D CAVE system Ford is using in Cologne, Germany may soon begin to trim that time down by months at a time. From without, the system looks like a tall three-sided cubicle with a ceiling – a basic dummy of a car interior sits in the center of the room. 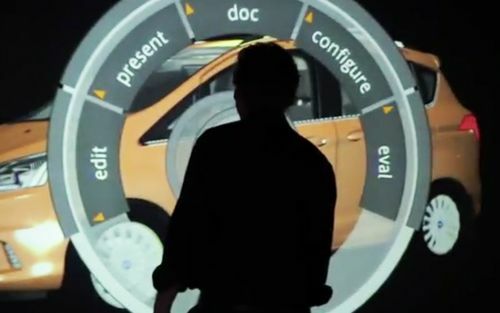 Projectors throw images onto walls and the ceiling, enabling the Ford designers to see a simulated interior through 3-D glasses. The virtual reality is so complete it even supplies variable exterior surroundings and ambient lighting conditions, to test how pillars or headrests affect exterior visibility and how legible gauges may be at various times of day or night. This process allows the firm to quickly field test thousands of variations without having to build full prototype models – a time-consuming and costly process. The system allows engineers to quickly see multiple design approaches with the mere activation of a button. The German 3-D CAVE is supported by a duplicate system in Dearborn, MI and numerous single wall units around the world. This allows experts in various Ford facilities to quickly compare notes on product development. So how did Ford's 3-D CAVE help the Focus? First, the system was used to enhance the effectiveness of windshield wipers and then to maximize rear occupant space by comparing various front seat and headrest designs. Next CAVE checked to see what effect the Focus doorframe design had on surrounding visibility and enabled the minimization of reflective glare that can obscure the legibility of gauges. It also provided a quick way to test the potential of the B-MAX’s Easy Access Door System, based on hinged front doors and sliding rear doors with integrated body pillars, providing unequaled access to the rear cargo or passenger area. It was further used to confirm the rear quarter window would deliver the best view for urban driving. Three-D simulations of wiper mechanisms singled out the butterfly type – moving in opposite directions – provides the clearest windshield in inclement conditions. We noticed how effective these kinds of wipers are during a recent test drive in this year’s crazy April weather. The firm has currently turned its attention to onboard entertainment controls, the opening and closing of windows, as well as other advanced driving simulations. When virtual reality hits a wall, the 3-D printer helps Ford compare competing components via quickly created tactile examples of parts. They even have three different types of resin to print different degrees of hard or soft parts for hands-on comparisons.